How much does it costs to complete a DISC EmpowerTM Assessment? It is free! Click here to start. What is the difference between the free report and the full report? You can see the difference between the free report and full report here. How is the assessment completed? You will be presented with groups of four statements. 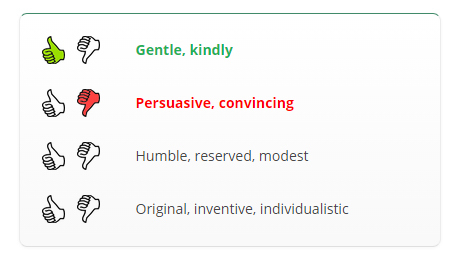 For each group, you need to select one of the statements that is MOST like you. You do this by clicking the Thumbs Up icon next to this statement. Then you select one of the statements that is LEAST like you. You do this by clicking the Thumbs Down icon. Why is the assessment timed? It is best if you don't "over-think" each group of statements. To help encourage you do the assessments quickly and intuitively, we recommend that you complete all 24 groups of selections within 7 minutes. What happens if it takes me longer than 7 minutes? At the end of the 7 minutes the timer will flash red. You must complete the assessment in the next 3 minutes (ie a total of 10 minutes for the whole assessments), or your answers will be reset, and you will have to redo the assessment as later date. You will not able to redo the assessment for 24 hours. Do I need to register (or log-in) prior to taking assessment? No: you can do the assessment without registering or logging in. However, you cannot view your report without registering and logging in. If you have NOT registered,you can do so for free here. If you have already registered, you can log-in here. If you would rather just jump in and do the assessment first you can do this here. If I have any questions about my DISC EmpowerTM report, can I speak to an advisor? If you would like to have a coaching session to discuss your report, you can register for this here. 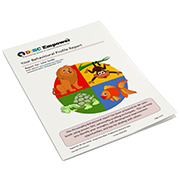 Can I reprint my DISC EmpowerTM report at a later date (ie in the future)? Yes, you can log in at any time and view, print or email your report. Is DISC EmpowerTM based on proven scientific research. Yes, you can learn more about the background to the development of this program here. I am a trainer / business coach. Can I use DISC EmpowerTM for my clients? Certainly we would be delighted for you to use the DISC EmpowerTM platform to help you develop your client's teams. If you would like to become a DISC EmpowerTM Accredited Advisor, please review this page here. I have a question that is not listed here. Can I send you a question? Yes! You can submit a question via this contact form.